Pence recently returned to teaching at the Immanuel Christian School in Springfield, Virginia, which does not allow LGBT students or students with LGBT families and refuses to employ LGBT individuals. LGBT activists have criticized the school's policies and Pence's decision to return there after 12 years. 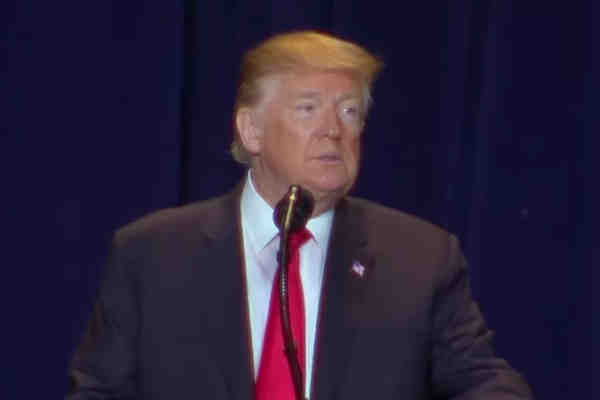 “To ensure that people of faith can always contribute to society, my administration has taken historic action to protect religious freedom,” the president told the crowd. “Religious freedom” is generally understood among social conservatives to mean support for policies that discriminate against LGBT individuals. An example would be a business that refuses to serve the LGBT community because of the religious beliefs of its owners. “My administration is working to ensure that faith-based adoption agencies are able to help vulnerable children find their forever families while following their deeply held beliefs,” Trump said, a likely reference to a recently-issued federal waiver to a South Carolina adoption agency allowing it to deny child placement services to gay or non-Christian couples.